Cool VL viewer updated to version 1.26.22.21 on October 20th – release notes. MetaChat updated to version 1.2.8010 on October 19th – release notes. A photogenic community sim, with a European-countryside theme. A full sim with a selection of areas to explore, interactive games to play, rides. We are very voice friendly. We provide rentals as well. Tags: Music, open mic, karaoke, blog, carnival. So reads the introduction to The Peak // Community, a new full region offering – as noted – a mix of public spaces and private rentals. Designed by KaidenTray, the region recently opened its doors to the public, and I was alerted to its presence by Shakespeare and Max, who had dropped in a couple of days prior to my own visit. There are a couple of remarkable things about this region. The first is the sheer visual appeal it presents, brining together a mix of elements together in what is as very photogenic setting that makes excellent use of the full 30K land capacity available to Full private regions. The second is, that as he notes in his Profile, Kaiden is a member of the Osbourne family in the physical world, and is not shy about the time he spends in Second Life (where he also runs a landscaping business). While described as a “European countryside theme”, The Peak perhaps most clearly has its roots in rural Britain in terms of overall approach and styling whilst also casting its net far wider than just the UK and Europe. The country church and many of the houses would not look out-of-place among the rural byways of England, whilst the rugged nature of the landscape perhaps carries with it a hint of Scotland; even the wooden chalets out on the southern side of the region suggest the holiday camps from the days before air travel became cheap enough for almost anyone to enjoy. But so too does The Peak carry within it hints of the continental life, thanks to a large Tuscan style villa sitting towards the south-east corner, at the end of one of the semi-paved roads. Just below this sits a little coastal village, slightly separated from the rest of the region by cliffs and rocky slopes. With the brightly painted frontage of the buildings, this could easily be a place sitting on the Spanish coast – as the signage over doorways further suggests. The more North American feel is evident on the north side of the region. Here, and to the east, a carnival sits, separated from the rest of the landscape by a narrow L-shape gorge. This is marked by the gentle rotations of a tall Ferris Wheel and the twisting madness of a roller coaster, while the derelict walls of a massive industrial-style building have been converted into both a bumper car arena and a gallery of street art, some of which carries a social message. It is here, perhaps that some of the region’s entertainment events will be held: parked within the carnival is a flat-bed truck, ready to serve as a stage for activities, while table games sit close by as an alternative from for entertainment to the park’s rides. Meanwhile, to the west, a large sign points the way to the expanse of a trailer park proudly flying the Stars and Stripes, which also incorporates the wooden chalets mentioned earlier. Quite excellent us is made of elevation throughout the region, with the roads and paths winding up and down slopes, around shoulders of rock, with cobble footpaths twisting their way down to what might otherwise be hidden walks along the edge of the sea, or by way of public courtyard down to the previously mentioned Spanish-themed village. For me, the winding, rise and fall of the principal road through the region again gives The Peak a distinctly English feel, as I’ve travelled along many such single-track lanes in certain parts of England many, many times. Being a relatively new region, most of the properties on the region have yet to be rented. Most are easily recognisable by the presence of a green For Rent box outside of them. I assume these boxes will vanish as places are rented, so a good rule of thumb during visits might be to treat the majority of houses, cottages and cabins on the region as rental / rented residences, regardless of whether a rent box is visible or not. For those who fancy being the lord (or laird) of the area, the rental properties extend to a fortified manor house, the church and manse close by adding to the feeling that this part of The Peak may have once formed a landed estate in the region’s past. At the time of my visit, some work was still going on within the region, so don’t be surprised if you come across the odd sign indicating this to be the case; there’s also something of a Halloween theme presents as well. But these aside, The Peak is one of the most engaging and considered new regions I’ve visited in Second Life: the wealth of detail, the blending of styles and ideas, the inclusion of a natural and atmospheric sound scape; all of this comes together to present a place well worth visiting, exploring, photographing and simply enjoying. Those who do take photos are invited to share them via The Peak Flickr group. 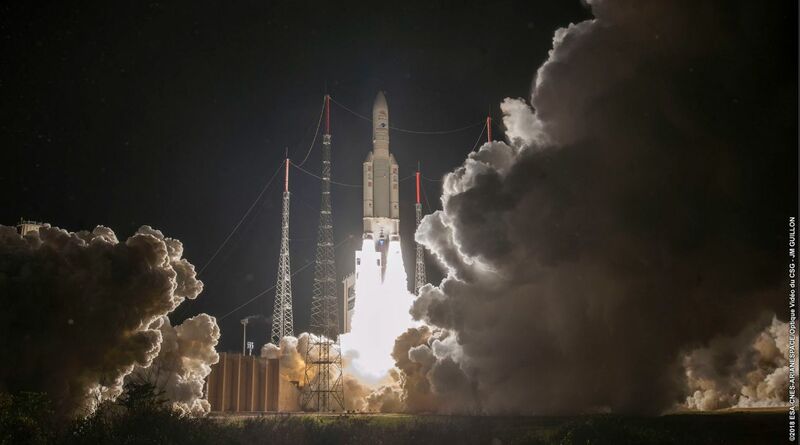 At 01:45 GMT on Saturday, October 19th, 2018, the European / Japanese BepiColumbo mission lifted-off from the European Spaceport in Kourou, French Guiana at the start of a 7-year voyage to Mercury, the innermost planet of the solar system. Named after Giuseppe “Bepi” Colombo, an Italian scientist, mathematician and engineer, who took a particular interest in Mercury, and first formulated the use of the gravity-assist as a part of an interplanetary mission (Mariner 10, 1973/75). The mission actually comprises four elements. There are two individual satellites, the Mercury Planetary Orbiter (MPO) and Mio (Mercury Magnetospheric Orbiter, MMO), an propulsion / power unit called the Mercury Transfer Module (MTM) and a Sun shield designed to protect the more sensitive instruments on Mio. Built by the European Space Agency, MPO weighs 1,150 kg (2,540 lb), and carries a payload of 11 instruments, comprising cameras, spectrometers (IR, UV, X-ray, γ-ray, neutron), a radiometer, a laser altimeter, a magnetometer, particle analysers, a Ka-band transponder, and an accelerometer. It also carries the smaller Mio, and will supply it with power until such time as the two separate once in orbit around Mercury. Mio, built primarily in Japan, masses of 285 kg (628 lb) and carries five groups of science instruments with a total mass of 45 kg (99 lb). The is a spin-stabilised platform, meaning that prior to detaching from MPO, it will be set spinning at 15 rpm so it can remain stable as it operates in a polar orbit around Mercury. The overall goal of the mission is to carry out the most comprehensive study of Mercury to date, examining its magnetic field, magnetosphere, interior structure and surface, with a primary mission period of one year. In addition, during the flight, BepiColombo will make the most precise measurements of the orbits of the Earth and Mercury around the Sun made to date as a part of further investigations of Einstein’s theory of general relativity. As noted above, it will take BepiColombo seven years to reach Mercury. This is because of a couple of reasons. The first is, contrary to what logic might suggest, getting closer to the Sun is actually harder than moving away from it when starting from Earth. The is because a vehicle departing Earth does so with a “sideways” motion relative to the Sun of around 67,000 mph (107,000 km/h), the speed the Earth is orbit the Sun, and this has to be overcome. At the same time, speed has to be managed so that the vehicle can also approach Mercury at a slow enough velocity to allow it to brake its way into orbit. To achieve both of these goals, the MTM on BepiColombo is equipped with the most powerful ion propulsion system yet flown in space. This is capable for maintaining a low rate of thrust over exceptionally long periods – much long that could be achieved by rocket motors and for far less fuel, given the ion system is electrically powered, using two 14 metre (46 ft) long solar panels to generate the power. The motor will be used to help slow BepiColombo in its flight, acting as a long-slow-burning brake. However, the ion motors aren’t sufficient to get the mission to Mercury; more is required. This “more” take the form of using no fewer than nine planetary fly-bys. The first of these will happen in April 2020, when BepiColumbo, now in an extended orbit around the Sun, will encounter Earth once more. This will bend the vehicle’s flight path inwards towards the Sun which will swing it past Venus in October of that year, the first of two Venus fly-bys. 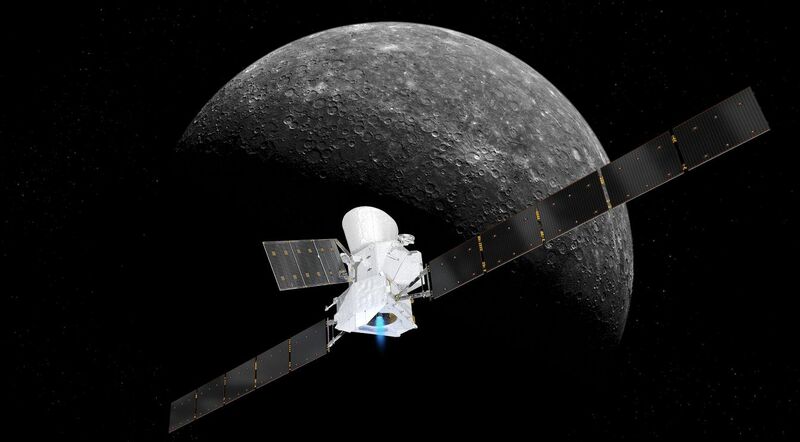 The second of these will occur in August 2021, and will bend BepiColombo’s orbit further in towards Mercury, which it will reach at the start of October 2021. But things don’t end there. While planetary fly-bys serve to bend a space vehicle’s trajectory, allowing it to “hop” from planet to planet, it also increases the vehicle’s velocity. Even with the long periods of braking possible using the ion motors, BepiColombo will be travelling too fast to achieve orbit around Mercury at that first encounter. Instead, the spacecraft will be placed in a solar orbit that periodically intercepts Mercury in is orbit, and over a series of five such encounters between June 2022 and January 2025, BepiColombo will use Mercury’s gravity in conjunction with its ion engines to slow itself down to around the threshold at which it can make orbit. This will occur in December 2025, as the vehicle makes its seventh approach to Mercury. However, with a mass of around 4 tonnes combined, the vehicle will still have too much inertia for the ion motors to bring it into orbit. Instead, the MTM will be jettisoned, and the smaller, lighter MMO will use its own high-thrust conventional motor systems to brake itself into an initial orbit around Mercury. 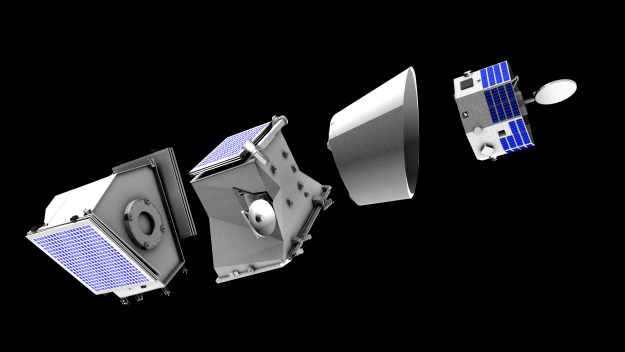 At the same time, Mio will be separated, so it can enter a more distant orbit around the planet.